In many ways living in a new country is intimidating. especially when you don’t speak the similar language to express yourself. The first few days are fun as you go out and keep telling yourself how different, how good everything is. You sigh and you wish things were similar back home. you go out almost everyday, explore new places, taste new food, some you like some you don’t but they have an occupying effect on you. You go to bed exhausted, get a good sleep dreaming of all things good and nice that you saw in the day. Then after a few weeks these initial excitements sink in, you start missing home. you miss every mundane thing. your day to day life, your weekly visit to the bazaar, that familiar taste of shukto lightly scented with Jharna ghee or the simple mere objects like your favourite pink pillow or how the morning sun used to stream in through the curtains. You miss everything but the thing you miss most is your parents, your family. You pine to share your new adventure with your brother. When your son bravely enjoys the bungee trampoline you want your parents to be there to shout and clap with you. And you miss them more when suddenly one afternoon the kid wakes up and starts crying, blaming you for bringing him away from his Dadubhai. You need to put a brave face on as you don’t have the heart or the answer to tell him the truth. Then one day while shopping you find your son talking to a stranger, you rush towards him to take him away but stop in the midway to see how happy he is. The old lady seems to be doting on your kid and you get the same twinkling in his eyes too. You silently watch them talking to each other in two completely different languages and are amazed to realize how everything made perfect sense. The old lady greets you when you near them and forms a fine sign with her fingers to tell you that your’s is such a well behaved kid. The lines on her face tells many stories but all you can see right now is the same joy that your mother gets when she meets her grand kids. now every time The little one sees any elderly person on the road he approaches them, says Hi and gets unconditional love and affection in return. Every time he falls on the ground or hurt himself, they are the people who reaches for him even before his parents could reach. There definitely is a similar thread of familiarity running every where, irrespective of the time, country or the culture...all you need is to open your heart to receive it. The recipe has nothing to do with this feeling. It was cooked on a rainy windy and chilly day when the son finally declared 'ami akhon jhal khete pari.' (I can eat spicy food). 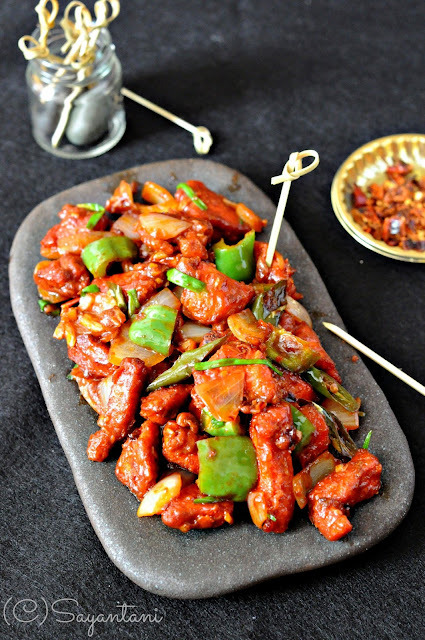 This is the quintessential red colour and taste enhancer sprinkled dry chili chicken. Just the kind you get from your favourite street side vendor in Kolkata, deep fried, tender chicken pieces in super spicy coating gravy with tons of green chilies and cubed onions. 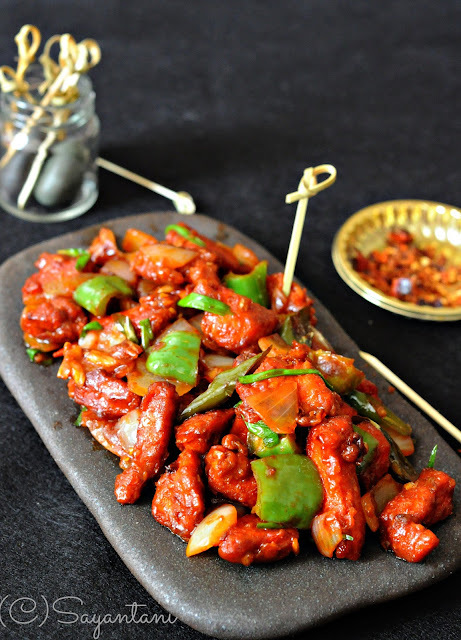 It’s one of the most favourite recipe that a meat eating Indian will like to order at any restaurant, its that special Indo-Chinese dish which you will get everywhere in India but would never see anywhere in China. few springs of spring onion chopped. oinch of red food colour (optional) I used. 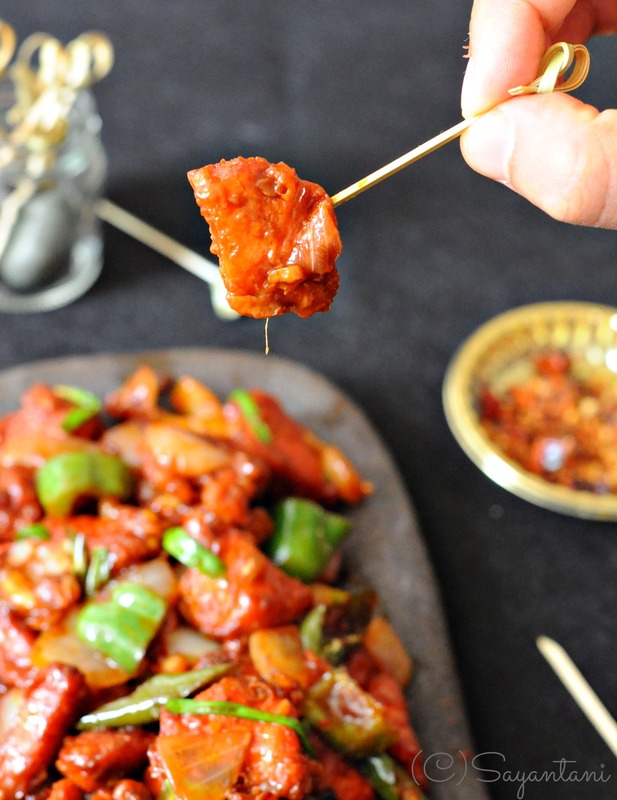 pound or make a paste of the ginger-garlic and 3-4 green chilies. mince the rest of the garlic, peel and cut the onion and capsicum in cubes. cut the chicken breasts in small (1") cubes. place the pieces in a bowl with 2 tbsp vinegar, 1 tbsp soy sauce, ginger-garlic paste and pepper powder. mix and keep aside for min 1 hour. Make the stick to one another. drain on kitchen paper. Mix 2 tbsp of corn flour to 3/4 cup of water and keep aside. If you are using the same pan then take out almost all the oil and keep only a tbsp. add the chopped garlic and 3-4 slited green chillies. Fry on medium till a nice aroma rises. immediately add the onions an with a pinch of salt saute it for a minute. add the capsicum and saute for few seconds. add all the sauces and 1/2 tbsp vinegar to this. mix in the chicken stir well with salt, sugar and pepper powder. once it starts to sizzle add the mixture of corn flour and water (give it a good stir just before adding). on low heat stir it continuously to coat all the chicken and veggies well. taste and adjust the seasoning. let it simmer on medium till all the gravy gets absorbed and the chicken pieces are shiny. sprinkle the chopped spring onion and serve hot. with rice, fried rice, noodles or as snacks with evening cuppa. I hardly resist to chicken dishes, seriously chilli chicken is mindblowing dear, mouthwatering here..Love that stone plate,damn cute. 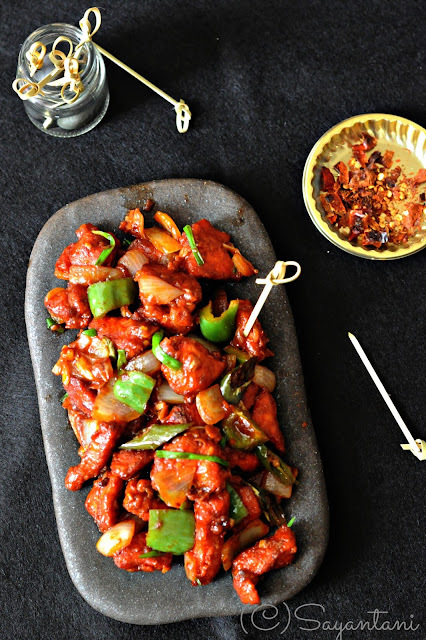 Chilli chicken looks so tempting and that plate adorable. Stone plate looks very adorable !!! That chilli chicken looks so very tempting and delish! Loved the way you plated your food.Do drop in at my space,looks like we have lots to share. Loved reading the experiences. Living in a new atmosphere can be enjoyable and intimidating too. Glad you are seeing the larger picture and enjoying the expereince. Loved the famous Indo chinese version !! Sayantani, these news tidbits you post about life in Japan are very interesting. The truth is kids will adapt much more quickly than you ever will. Good Luck make the most of it. It is amazing the number of people especially older people who will come and talk when kids are with you. They get great pleasure in interacting with the kids. I have made many friends in the places I visit regularly only because I have DD2 with me. Most will never approach and talk if the kids were not with me. As for this yummy chili chicken. It never fails to make you happy. OH, This looks so delish! I love Chicken too, and your recipe using this ingredient really shows that you are an expert cook! 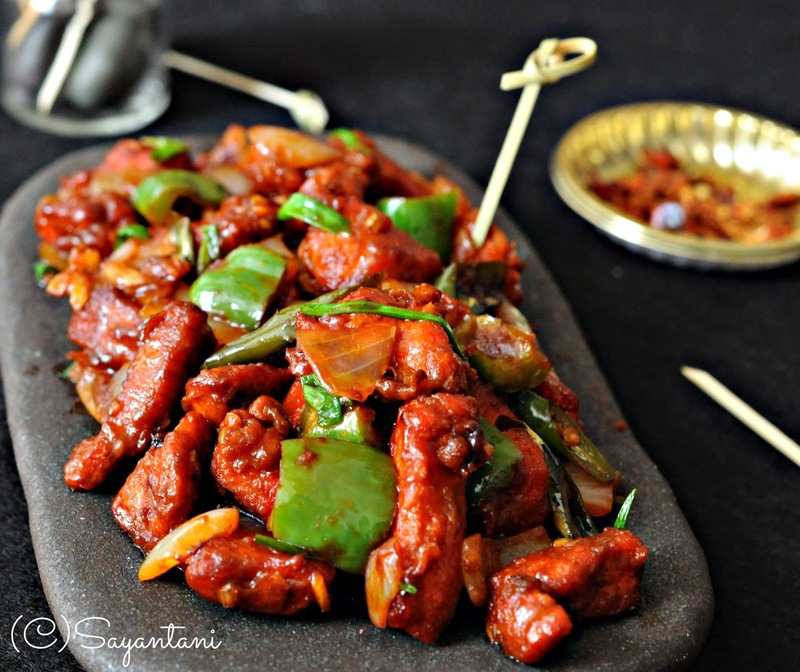 This looks lip smacking, Sayantani. Drooling. Sayantani ..... this is such a heart touching writeup. I enjoyed it thoroughly. And you have become an avid photographer to say the least. I may not b commenting on those pics religiously ..... pardon me for that, but I swear I luv each one of those. me tell you, your site gives the best and the most interesting information. Spotted this and have to make it right now...looks amazing. looks lovely...going to cook this right now!